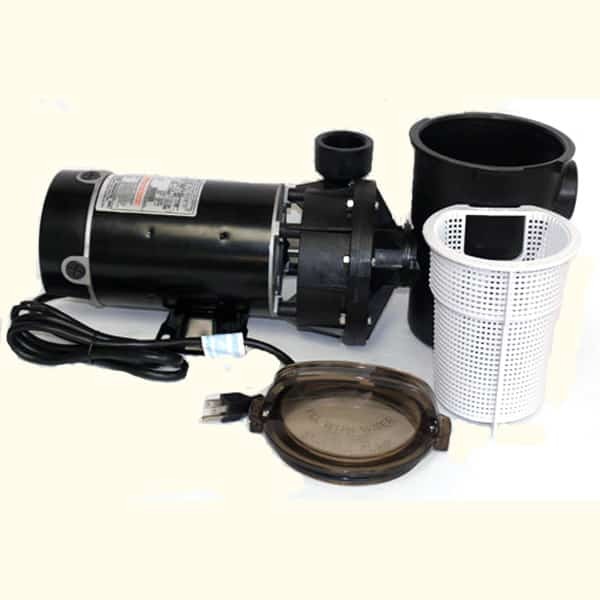 Hayward is the world's leader in pool pumps, pool filter systems and pool filter parts. Using on the highest quality materials will ensure that your pool parts are reliable and efficient. Pump Location: The Power-Flo LX™ pump MUST be installed below the pool water line (see Figure to right). 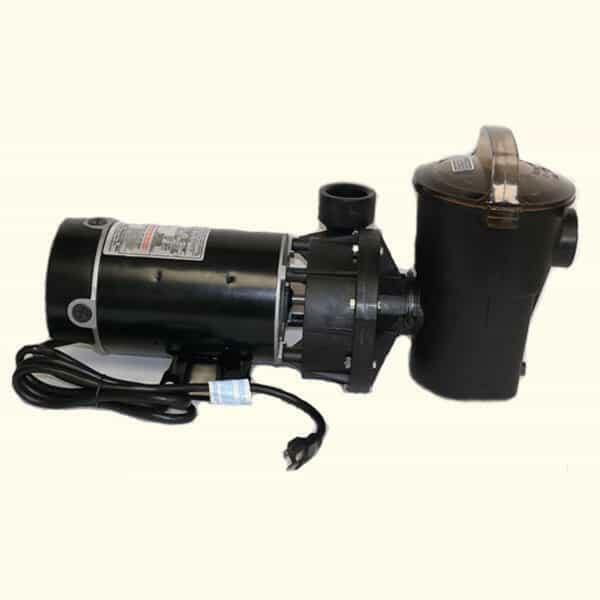 Self-priming Power-Flo II™ pumps may be installed up to four (4) feet above the pool water line.Install pump on a firm, level base or pad to meet all local and national codes. The field supplied base or pad must be level and vibration-free. 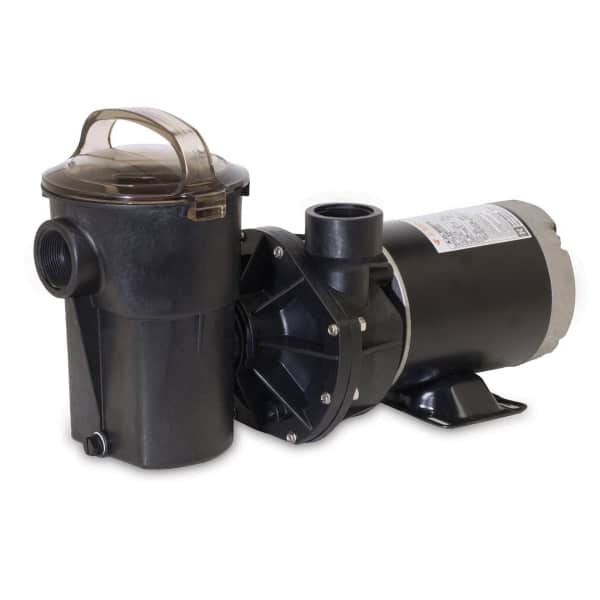 Pump motors require free circulation of air for cooling. Do NOT install pump in a damp or non-ventilated location. 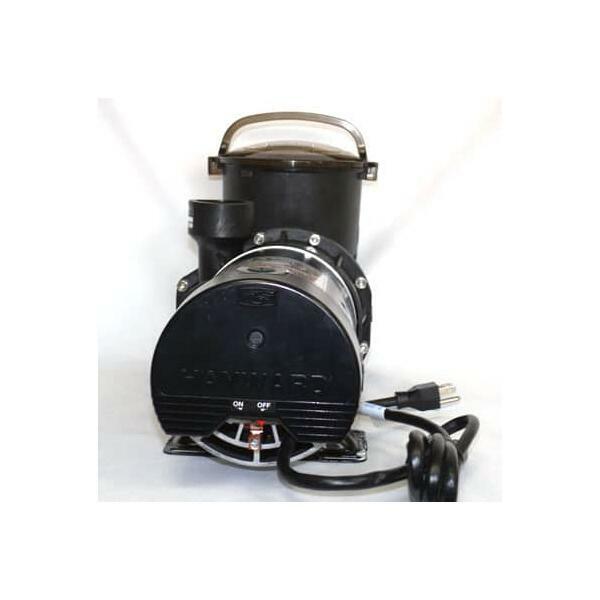 Though the pump is designed for outdoor use, it is strongly advised to protect the electrical components from the weather. Select a well-drained area, one that will not flood when it rains. Plumbing - Use Teflon tape to seal threaded connections on molded plastic components. All plastic fittings must be new or thoroughly cleaned before use. NOTE: Do NOT use Plumber’s Pipe Dope as it may cause cracking of the plastic components. When applying Teflon tape to plastic threads, wrap the entire threaded portion of the male fitting with one to two layers of tape. Wind the tape clockwise as you face the open end of the fitting, beginning at the end of the fitting. 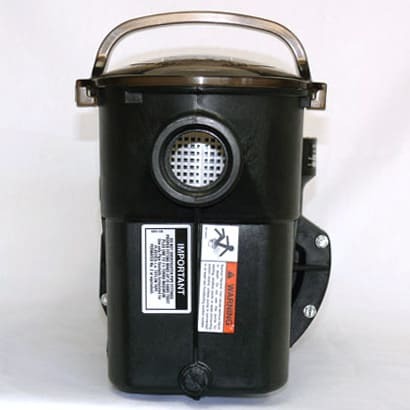 The pump suction and outlet ports have molded-in thread stops. Do NOT attempt to force hose connector fitting past this stop. It is only necessary to tighten fittings enough to prevent leakage. Tighten fitting by hand and then use a tool to engage fitting an additional 1 ½ turns. Use care when using Teflon tape as friction is reduced considerably; DO NOT over-tighten fitting or you may cause damage. 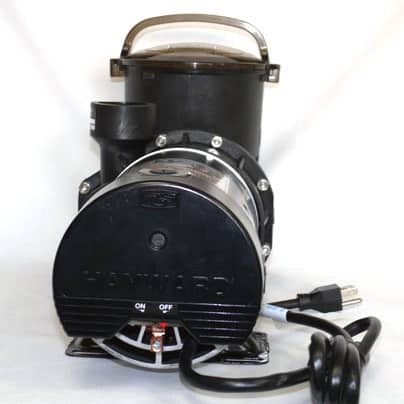 If leaks occur, remove connector, clean off old Teflon tape, rewrap with one to two additional layers of Teflon tape, and re-install connector. Piping Flexible Hose, PVC, or Reinforced Hose are all acceptable piping methods. For pump outlet use 1-1/2" PVC pipe or reinforced hose. For pump suction on ALL models, use 1-1/2" reinforced hose. Increase size if a long run is needed. For pipe larger than port, use reducing fitting in strainer port. To avoid pump strain, support suction and outlet independently. Place supports near pump. To avoid strain left by a gap at last connection, start all piping at pump and run pipe AWAY from pump. NEVER use suction pipe SMALLER than pump suction connections. Suction pipe inlet must be lower than pump inlet port. Fittings - Fittings restrict flow. For better efficiency, use the fewest possible fittings. Avoid fittings that could cause an air trap. Pool and spa fittings MUST conform to the International Association of Plumbing and Mechanical Officials (IAPMO) standards. 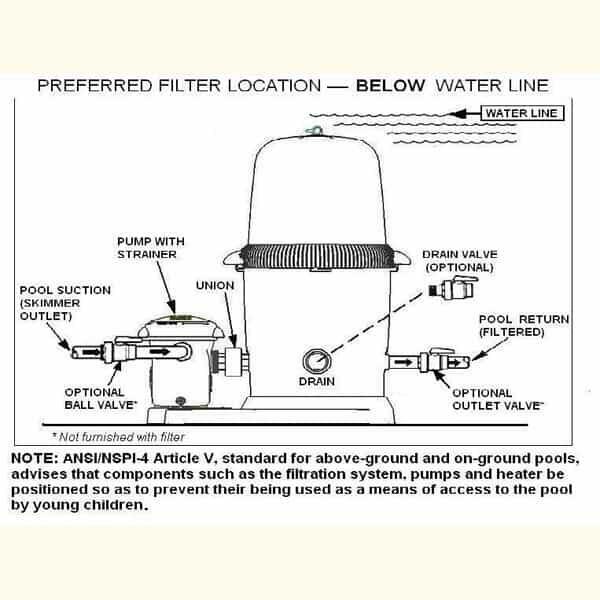 Use a non-entrapping suction fitting in pool or double suction (skimmer and main drain). Voltage - Voltage at motor MUST NOT be more than 10% above or below motor name plate rated voltage, or motor may overheat, causing overload tripping and reduced component life. If voltage is less than 90% or more than 110% of rated voltage when motor is running at full load, consult power company. Grounding / Bounding - Install, ground, bond, and wire motor according to local or national electrical code requirements. Permanently ground motor. 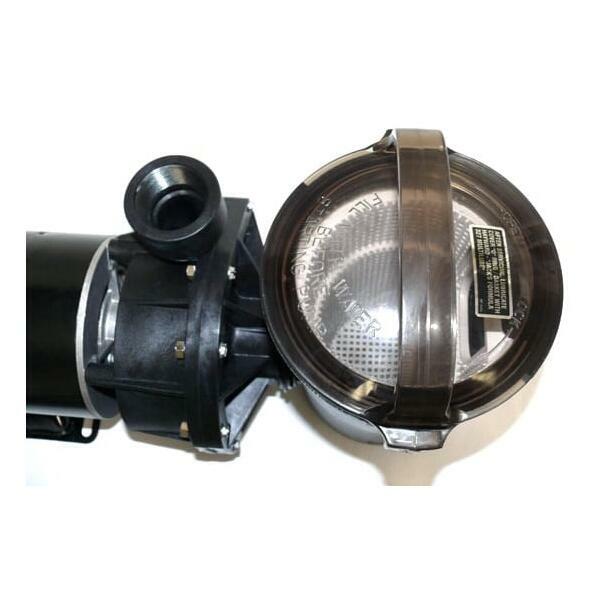 Use green ground terminal provided under motor canopy or access place; use size and type wire required by code. Connect motor ground terminal to electrical service ground. Bond motor to pool structure. Use a solid copper conductor, size or larger. Run wire from external bonding lug to reinforcing rod or mesh. Connect a No. 8 AWG (8.4 mm2) solid copper bonding wire to the pressure wire connector provided on the motor housing and to all metal parts of swimming pool, spa, or hottub, and to all electrical equipment, metal piping or conduit within 5 ft. (1.5 m) of inside walls of swimming pool, spa, or hot tub. Wiring - Pump MUST be permanently connected to circuit. If other lights or appliances are also on the same circuit, be sure to add their amp loads before figuring wire and circuit breaker sizes. (NOTE: If unsure how to do this or if this is confusing, consult a licensed electrician). Use the load circuit breaker as the Master On-Off switch. Install a Ground Fault Circuit Interrupter (GFCI) in circuit; it will sense a short-circuit to ground and disconnect power before it becomes dangerous to pool users. 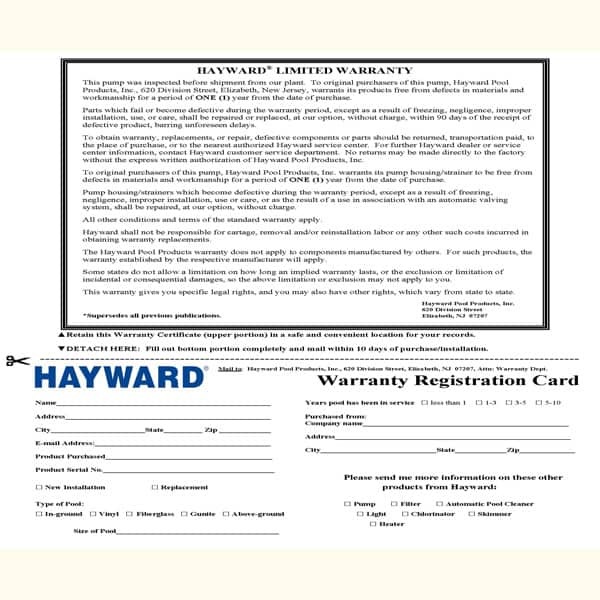 For size of GFCI required and test procedures for GFCI, see manufacturer’s instructions. In case of a power outage, check GFCI for tripping, which will prevent normal pump operation. Reset if necessary. NOTE: If you do not use conduit when wiring motor, be sure to seal wire opening on end of motor to prevent dirt, bugs, etc., from entering. New Installation – Start-Up & Operation prior to pool start-up - Fill strainer housing with water to suction pipe level. NEVER operate the pump without water. Water acts as a coolant and lubricant for the mechanical shaft seal. Priming Pumps - Open all valves before starting system. Release all air from filter and piping system. See filter owner’s manual. When water source is higher than the pump, pump will prime itself when suction and outlet valves are opened. 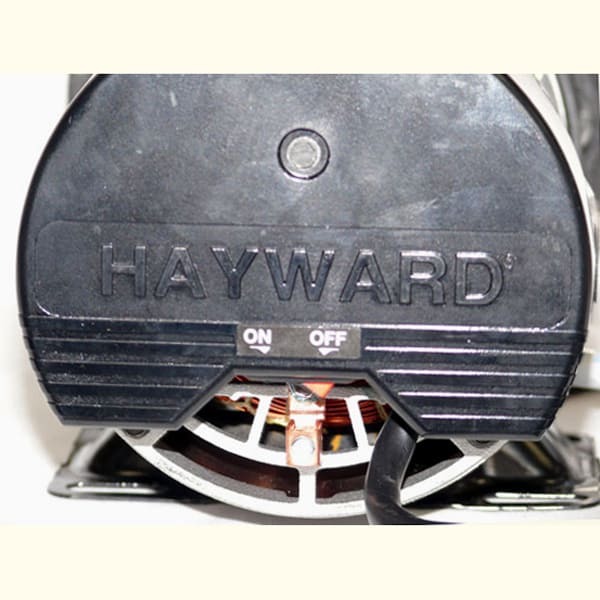 If water source is lower than the pump, unscrew and remove strainer cover; fill strainer and pump with water. Clean and lubricate strainer cover O-ring with "Jack's 327" each time it is removed. Clean and inspect O-ring; re-install on strainer cover. 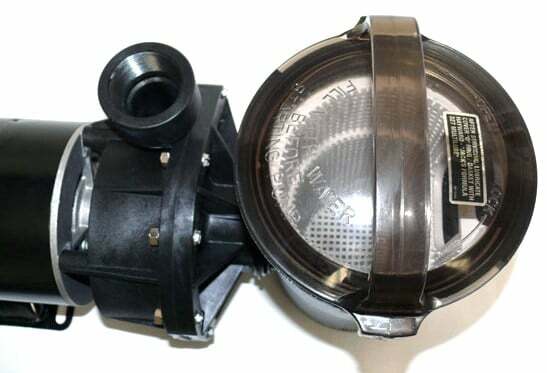 Replace strainer cover on strainer housing; turn clockwise to tighten cover. NOTE: Tighten strainer cover by hand only (no wrenches) ¼ turn. Pump should prime. Priming time will depend on vertical length of suction lift and horizontal length of suction pipe. If pump does NOT prime within ten minutes, stop motor and determine cause. 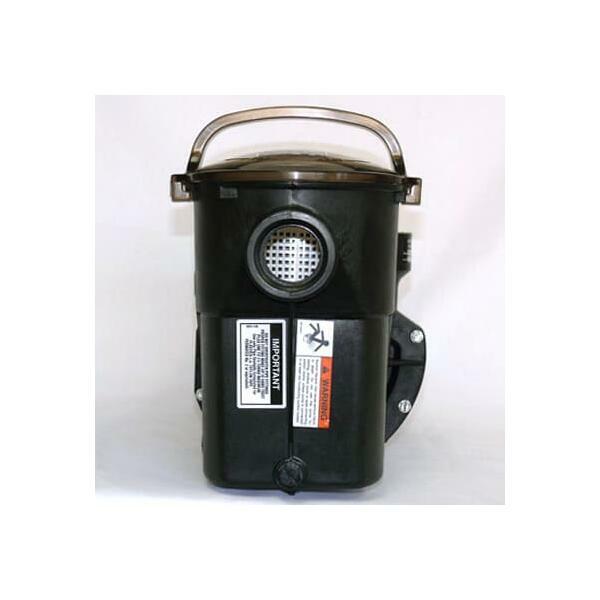 Be sure all suction and discharge valves are open when pump is running.